Round Tube Side Steps - Accessories Inc.
TrailFX Black Powder-Coated Steel Round Tube Side Steps carry a 3-Year Limited Warranty to the original owner. Warranty covers finish defects from normal use. 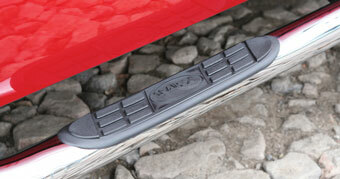 TrailFX Bed Round Tube Side Steps have a custom step pad that is hermetically fused to the bar to never come off. The tube is crimped before this is installed.